Kaleidoscope is the result of a commission to sculptor Robert Orchardson to make a work in response to The Hive. Orchardson was particularly struck by the library’s guiding inspiration that ‘learning’ and attendant cultural processes of exploration, finding out, thinking, imagining, inventing and knowing are the province of all citizens – and to be nurtured and celebrated accordingly. The Hive, in these terms, he saw as a declaration of hope and possibility, and a rare project of enlightenment at a time of national difficulty. 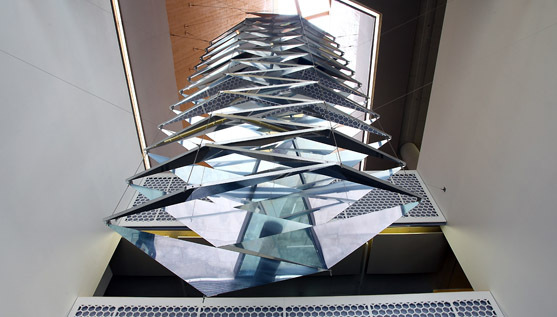 Kaleidoscope has been designed to be visible from all three main floors of the building, with each opportunity to view it providing alternative glimpses and understandings of its form. Through a deceptively simple structure, cunningly fabricated and engineered, Orchardson’s aim has been to orchestrate and heighten viewers’ experiences of the endlessly shifting play of light that occurs within the building and, through their experience of his sculpture, themselves to engage in playful interaction with the architectural spaces through which they move and in which they have come to read, research and enquire. Robert Orchardson is based in London. Recent solo exhibitions have been held at Ikon Gallery, Birmingham and CAG, Vancouver and his work is included in a number of major collections including the Saatchi Collection and the UK Government Art Collection. 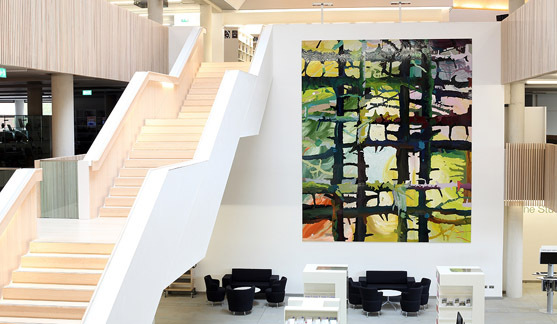 Clare Woods identifies Rack Alley as concluding an extended period of work, during which she has made a sequence of large-scale paintings that respond to the architectural spaces in which they are installed. This painting was made especially for the atrium of The Hive. It stems from Woods’ consideration of the building and the commissioners’ aspirations for its role within the city, as well as her exploration of the history and archaeology of Worcester as they contribute to the city’s contemporary formation. Woods’ source material has included, for example, the remnants of the city’s walls, architectural details from the cathedral, the great arches of the adjacent Victorian viaduct and the passage of the Severn. She has been particularly interested by Worcester as a confluence of route ways and through ways, the uses and configurations of which have developed over time. As well as these local influences, Rack Alley draws on Woods’ long-standing preoccupations with centuries of British landscape painting and with the idea of ‘nature’ and the pull, upon our imaginations and consciousness, of organic and geological formation and forms. Perhaps most importantly of all, for the artist, is her preoccupation with painting itself - with the communicative and visual possibilities that are unique to painting. It is painting’s continuing currency and possibilities that drive her work. Rack Alley was commissioned by the University of Worcester and Worcestershire County Council to celebrate the opening of The Hive and with the aim of contributing to visitors’ experience of it over the coming years. Clare Woods now works from her studio in Herefordshire, having recently moved there from a base in London. In the past twelve months, in addition to completion of Rack Alley she has held solo exhibitions at The Hepworth Wakefield and Southampton City Art Gallery and completed a large-scale commission for London’s Olympic Park. Her paintings are held by public collections including The National Collection of Wales, Arken Museum of Modern Art, Copenhagen, the Arts Council Collection, and Albright-Knox Art Gallery, Buffalo. In 1840, the poet John Clare escaped from an asylum in Epping Forest and, over four-days, walked some 80 miles home to the fenland of north Cambridgeshire. Soon after, Clare wrote an account of his escape, using notes made during his journey. Together with an accompanying letter, Clare wrote his story for Mary Joyce, his childhood sweetheart, whom he mistakenly believed to have become his wife. Mary had, in fact, died in a house fire a few years earlier and Clare had been married to another woman, Patty Turner, since 1820. Clare’s account of his journey describes the adversity of his walk from Epping Forest to Glinton (where he went to school): without map or money he had orientated himself by lying down at night facing north so that, when he awoke, he knew which way to continue. Reduced to begging for bread and beer and eating grass by the roadside, he arrived emaciated, footsore and hallucinating. Patty took him home to Helpston (where he was born) and eventually committed him to another asylum. Clare’s escape and subsequent journey can be seen, artist James Fisher suggests, as both a literal and metaphorical striving for ‘home’: the poet associated Mary Joyce and physical freedom with his childhood and origins. In his account of his walk, a sense of what is ‘real’ wavers between mundane fact, fantasy, misremembering and hallucination. The narrative is difficult to grasp and slips readily from comprehension. A series of ghostly encounters are related and the poet’s movement through the landscape seems, by turns, unearthly and painfully real. I Quaked Like the Ague and Eat the Quids were made with John Clare’s narrative in mind. They are two of a series of paintings that feature Mary Joyce holding Clare, in the form of an imagined animal, in her arms. Joyce and Clare are realised in paint as ethereal figures in a transient landscape – achieved by each painting’s delicate accumulation of stains and traces of powdered pigment. For the artist, this was an attempt to portray Clare’s uncertainty and the strangeness, to him, of what was beyond his known horizons. James Fisher is based in Gloucester and is Senior Lecturer in Fine Art at the University of Worcester. 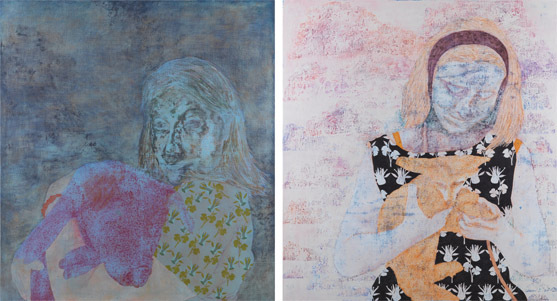 These two paintings were initially made as part of his PhD study and subsequently exhibited in a solo exhibition staged in London and Chipping Campden in 2008. Another work from the series is in the collection of the Jerwood Foundation and was included in the 2011 opening programme of the new Jerwood Gallery in Hastings.